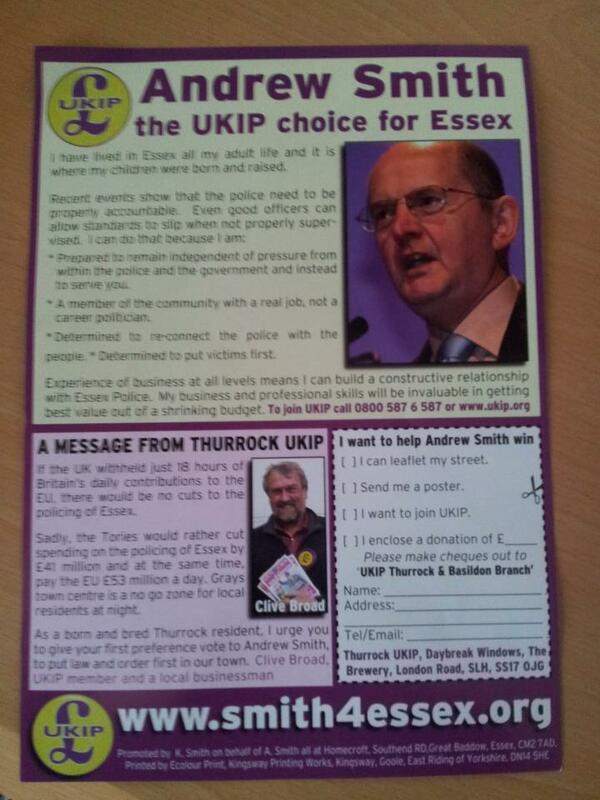 So to Essex on a cold and damp Saturday to assist UKIP’s candidate for Police Commissioner, Andrew Smith, on the doorsteps of Harlow. Setting out from Hillingdon at 9.30am for an 11am meet, I tuned in to LBC radio for my trip around the northbound M25. From 10am, the Ken Livingstone and David Mellor show concentrated for an hour on the impending rise to the EU budget and even ‘Red’ Ken was stating that this can’t be justified with austerity cuts at home! A number of callers rang in to complain about the situation, and some said they would be voting UKIP because of the issue, which in one case brought an exasperated comment from Mellor that the party are ‘Nutters’ despite pretty much agreeing with our stance all the way through the show! We were quickly briefed on the situation in Essex – With a supplementary vote system* in place for the Police Commissioner elections, Labour and Conservatives have been pretty confident that their candidates will battle it out in the ‘second round’ and have not been as active on the ground as expected. 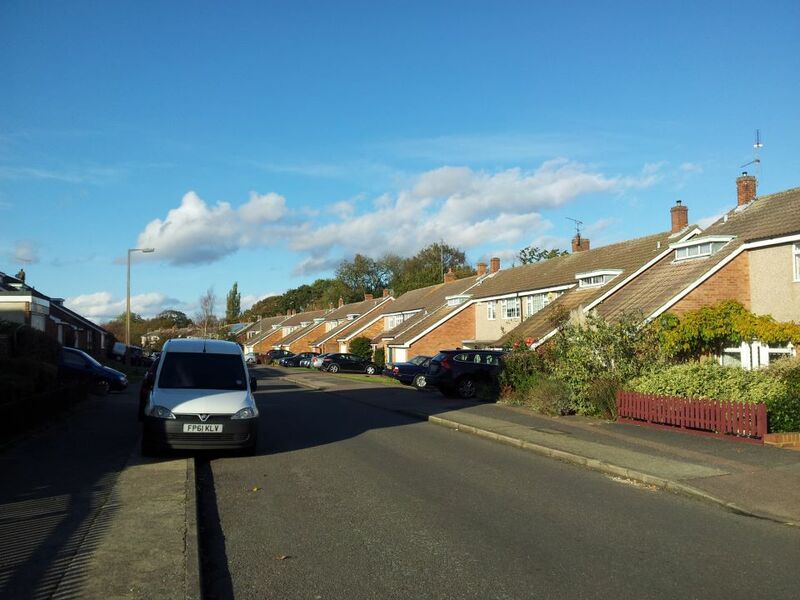 Our task was to leaflet specific areas that UKIP had not yet touched during this campaign in order to spread the word and give Andrew a fighting chance of dislodging Labour from second place on the initial vote.Success in this objective would mean a ‘head to head’ with the Tories in round two. 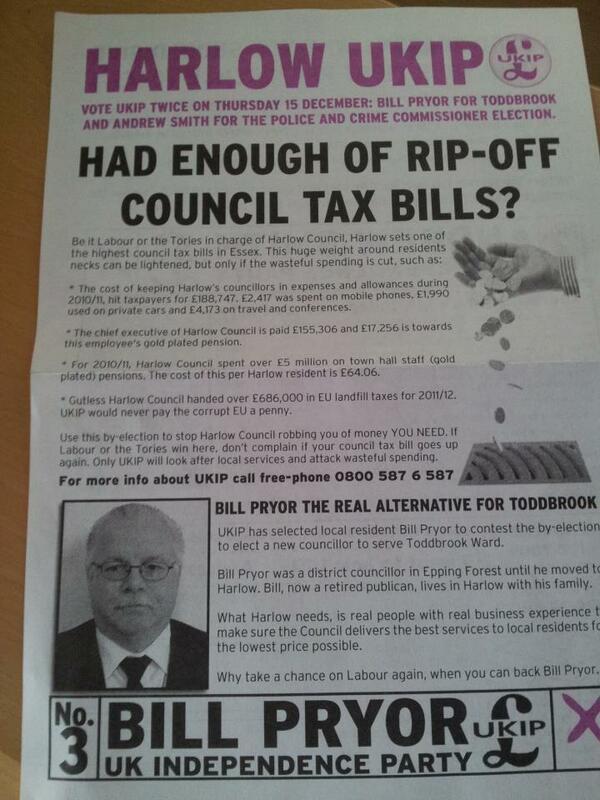 I was greeted on the doorstep by one lady who asked what the leaflets were about – When I explained that they were for the council and Police Commissioner elections and she saw the UKIP logo she commented that ‘I hope you get in, you are so much better than those Tories’. She then asked what we were going to do about mass immigration – My answer regarding the five year freeze on permanent immigration whilst the system is sorted out followed by an Australian style points system gained her approval and the promise of her vote on 15th November! With two targets completed in less than two hours, I moved on to the final map. This was a rambling estate of what appeared to be late seventies/early eighties construction and ranged from small flats all the way up to large and opulent detached properties at the far end. With the haphazard layout of the streets and closes, it was difficult to keep your bearings and the time started to drag as I was confronted with a veritable maze to navigate! 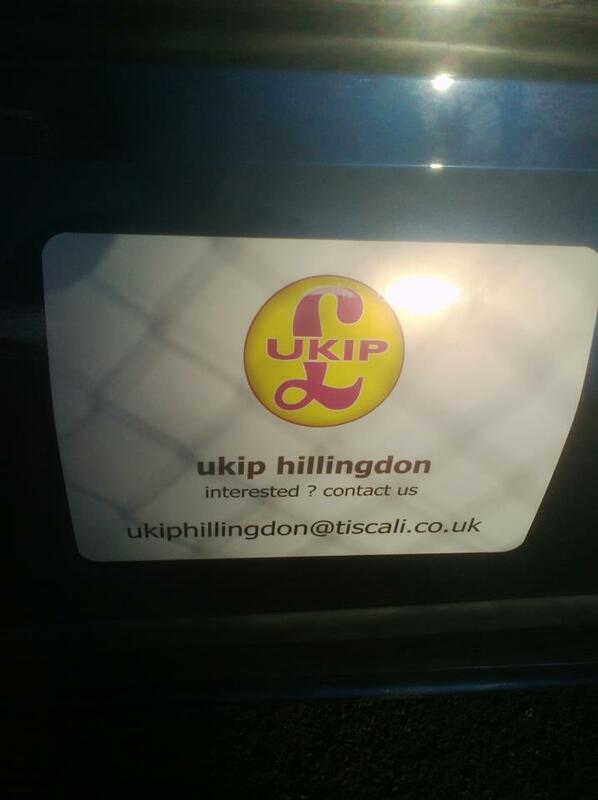 One white van man called out to me not to put a leaflet through his door – I promised him it was not a pizza delivery flyer, but he was even less enthusiastic when told they were for a local election! “I don’t want all that, you are all the same” came his reply. “Are you not voting then sir? If you don’t vote, you are helping to cause the problem when you could be a part of the solution, don’t you think?”. “Nah mate, not for me!” – I smiled as I walked off imagining him complaining down the pub about the cost of fuel and the state of the roads when he didn’t even want to read a quick leaflet addressing the issues. Oh well, you win some…..
Finishing just before dark with all the leaflets exhausted, I returned to the car and the trip back to Uxbridge.